This week's Meatless Monday Recipe Round-up via my posts over at Babble's Family Kitchen include a tropical shake to help you sip the winter blues away, a healthy bowl-fest of recipes, a vanilla cream pie. 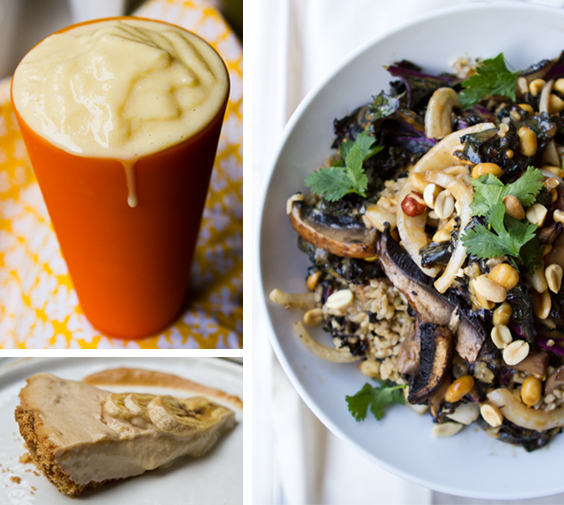 Get these recipes and more inspiration for your Meatless Monday and the week ahead!.. What are some of your recent *feel good* video finds? Who says you can't make smoothies in winter. In fact, this frosty sip will help you daydream of exotic, tropical, beachy, sea-breeze places. Turn up your thermostat, warm up your vitamin and grab a straw! I LOVE a good bowl. In fact, I prefer to a bowl to a plate any day. Browse my 21 favorite cozy-bowl recipes including warming soups, salads and grain-goodness bowls galore. Take my have peanut kale salad, add some rice and amazing mushrooms and you get a super duper dinner that will satisfy a hungry crowd or dinner for one. Peanuts and cilantro on top. Bananas, vanilla and creamy caramel make this dessert a cravable dish on my menu. Add a top layer of coconut whip or coconut cream to make an amazing Banana Cream Pie - or eat as shown! The snakiest day of the year is only a few weeks away. Try these guy-approved vegan snacks for your winter TV watching fun. Cheezy nachos and jalapeno poppers are just a few of the delicious recipes in this round-up. Stop worrying about what to remove from your diet and start focusing on adding healthy foods. By feeding your body the good stuff, you may crave less of the not-so-good stuff. From fiber-rich chia seeds to fresh-pressed juices and spicy metabolism-lifting foods - here are my 19 ways to detox for a healthy 2012. Fresh start! About my Meatless Monday round-ups: Once a week I link to all my posts over at Babble.com so that you don't miss out on any of my recipes. My round-up is a great way to embrace Meatless Monday.